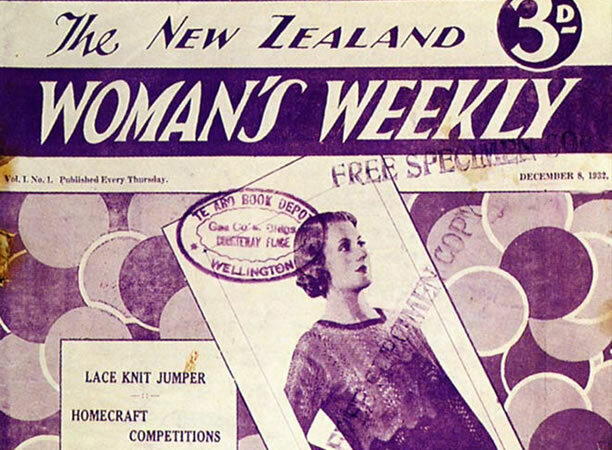 On 8 December 1932, the 7000 copies printed of the first issue of the New Zealand Woman’s Weekly went on sale. Launched during the Depression, the magazine hoped to offer ‘usefulness, cheerfulness and happiness’ to its readers. The Woman’s Weekly Publishing Company, owned by Otto Williams (editor of The Mirror) and Audrey Argall (a freelance writer who was running a nursing home) was based in the Mutual Life building in Queen St, Auckland. The articles were written by Argall (the editor) and various friends. The first issue boasted a purple and white cover and contained many elements that would become staples of the publication: advice on cooking and housework, romantic short stories, knitting patterns and feature articles. But, despite an enthusiastic start, the Woman’s Weekly Publishing Company ran out of money after only three months. Veteran Auckland city councillor Ellen Melville saved the magazine. She sold it after a few months to solicitor Vernon Dyson, who owned it for a year before also selling it. Dyson installed his wife Hedda, an experienced Dutch journalist, as editor, a position she retained until 1948. The New Zealand Woman’s Weekly continues today as one of New Zealand’s most popular magazines. We have 11 biographies, 5 articles, related to First issue of New Zealand Woman's Weekly.